Dioxide Pacific is the Australia and New Zealand distributor for Diflon TECHNOLOGY srl. 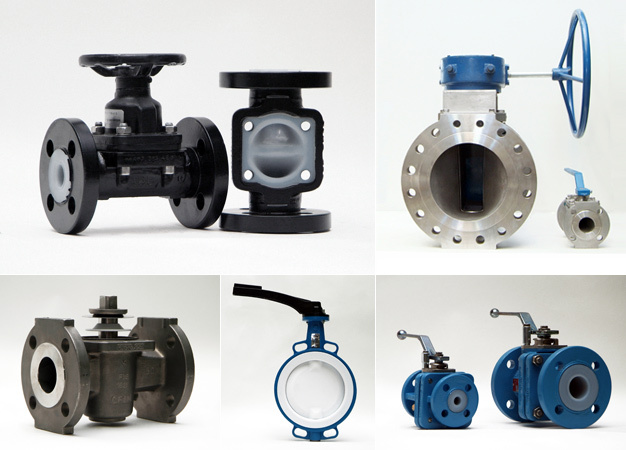 Diflon specializes in manufacture of PTFE and PFA lined pipe, valves and tanks. Many years of successful operation have culminated in a complete supply range of pipes, fittings, flexible hoses, expansion joints, columns and tanks in PTFE lined metal and supply of gaskets and other pieces in PTFE. DIFLINE Carbon steel or stainless steel pipes and fittings with virgin PTFE internal coating. The PTFE coating covers all metal internal parts up to the seal face of the flange, thereby preventing chemical contact with metal and avoiding corrosion. manufactured according to DIN 2848 and the 97/23/CE PED certification. DIFLINE pipes are self-supporting and do not require racking and bracketing that is typically required for plastic pipework. Service temperatures -30°/+200°C. PTFE is permeable to chlorine gas and it is not compatible with alkali metals and fluorine gas. Temperature range: normally -10°C to +200°C. Maximum operating pressure = 6 Bar. Special solutions can be provided for vacuum applications. TANKSLINE lining is virgin PTFE processed to guarantee the PTFE is hydrophobic and dimensionally stable. PTFE linings are available in thicknesses from 3 to 5 mm. PTFE is known to be non-stick, ensuring high resistance to fouling, eliminating or reducing downtime for cleaning. Columns and tank diameters: DN 300 to DN2000 in flanged sections up to 2 m in height, flat or taper end plates with welded or machined nozzles and a range of PTFE internals such as distributors, supports, rings, diffusers, suction tubes, etc. Please see the TANKSLINE catalogue for details of the full range. The PTFE lining can be repaired if it becomes damaged. The FLEXLINE range consists of PTFE tube with external stainless steel sheath; PTFE or PFA pipes with thin walls; rubber and pure silicone multi-layer hose. Hose can be supplied with any kind of fitting to suit your requirements. Expansion joints are used to join tanks, machinery, pumps and pipework to minimize vibration and take care of expansion caused by thermal expansion and contraction, pressure changes, external movement and pipeline weight. Safety Spray Shields are designed to temporarily contain hazardous leaks and sprays from plant equipment connections. Leaks can occur on piping systems conveying chemicals, high temperature fluids, and steam, which can harm workers, nearby equipment, and the environment. Leaks of flammables, such as fuel or oil, can create fire and explosion hazards. Diflon offers gasket cutting, a large inventory of standard flat gaskets and special gaskets manufactured to your requirements. Diflon offers sheet gasket material in size 1,500 x 1,500 mm in thicknesses of 1, 2 and 3 mm. DIFLEX is resistant to almost all chemicals, pH 0-14, acid and strong alkali, solvents, chlorine, catalyzers, liquid gas, vapour, diathermal oils, food, pharmaceutical and petrochemical products, etc. ; the only exceptions are melt alkali metals and fluorinated products. DIFLEX is recommended for use in the chemical, petrochemical, pharmaceutical, food, cryogenic industries, etc. DIFLEX gaskets were first used in 1993 by major engineering companies. DIFLEX gaskets can be used for continuous service at a temperature range of -150°C to +260°C and also under high pressure. Diflex gaskets are also available in welded versions, even for diameters exceeding 3 m, or according to the your specifications. OCEAN flat strip for gaskets is 100% pure PTFE material processed into a fibrous molecular structure . Resistant to all chemicals except for some fluoridated compounds and molten alkali metals. Does not contaminate the media with which it comes into contact; it does not release color particles and is non-toxic. We can provide OCEAN to any size you require. Making a seal from the OCEAN flat strip is an extremely simple task. The adhesive side of the strip has a protective band. To apply the strip, first remove this strip and press against the surface to be sealed. Then the two ends of the strip are joined, one on the top of the other. Alternatively, you can cut diagonally and join end to end if the tightening pressure is low. A standard flat gasket is the result. ePTFE-BIAX – Gasket Sheets consist of pure, expanded PTFE. In the manufacturing process, a multi-directional fibrous texture is produced, which gives the gasket sheets their special properties. OCEAN sheet material has very low compression and low dimensional change even under extreme conditions of high surface pressure and high temperature (especially compared to material from other manufacturers). ePTFE-BIAX – Gasket Sheets is especially designed to conform to the highest safety requirements such as in critical flange joints in oxygen pipelines. Impregnation to the heart (also known as yarn-by-yarn impregnation), offering guaranteed tightness to improve efficiency. lubricants and binders, essential when using Packing, as these must not react with the fluid or corrode the metals surrounding the Packing and also eliminate friction. This category includes mineral, vegetal and synthetic oils and greases (for universal use), dry or dispersed graphites (for external treatment with excellent self-lubrication and anti-friction properties), dispersed (for lubrication and anti-friction treatment on Packing coming into contact with chemicals and corrosive agents) and Molybdenum Disulphide MoS2 (used in external treatments with particular self-lubricant and anti-corrosive properties). PTFE has optimum dielectric properties within a vast range of temperatures and frequencies. As water absorption is virtually nonexistent, these properties are maintained even after a prolonged exposure to weather agents. Electric strength is practically not influenced by the operating temperature. The resistance to arcing of PTFE is considerable and the spark does not generate carbon residues but only non-conductive vapors. The other electric properties (dielectric constant, surface resistivity, volume resistivity, power factor, etc.) show very interesting values. 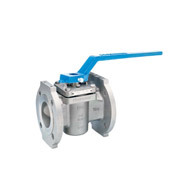 FluoroSeal®, Non-Lubricated, Sleeved Plug Valves incorporate the latest PTFE fluorocarbon seat design. You can expect low maintenance and trouble-free operation. High integrity bubble-tight sealing is provided inline and to atmosphere. The waterway in the body has been designed with a contour providing a flow path that assures minimum flow turbulence characteristics. The critical sealing areas around the top and bottom of the sleeve and around the body port openings are maintained by means of an adjustable tapered plug compressing the PTFE sleeve over raised ribs. The PTFE top seal components are similarly contained and protected from damage. A counter bore is provided at the top of the metal body to encapsulate the outside diameter of the formed PTFE diaphragm in conjunction with the formed metal diaphragm and to protect it. The inside diameter of the formed PTFE diaphragm, adjacent to the plug stem, is also contained by means of a unique lip design of the formed metal diaphragm preventing extrusion and maintaining the stem seal throughout variable service conditions. This uniquely formed metal diaphragm also provides a positive electrical ground between the plug and body, eliminating the need for an extra component to fulfill this function as is the case for other valve manufacturers’ designs. Extended neck provides adequate distance for piping insulation. Duplex stainless steel disc/shaft assembly is M-PTFE molded with fully machined sealing surfaces. Ball & Socket disc-hub design. Three TFE coated radial bearings keep disc/shaft assembly stable by eliminating disc deflection and actuation side loads. The shaft is carried in triple, maintenance-free bearings. M-PTFE liner is third generation TFE with improved permeation, porosity and cold flow characteristics. Fully machined conical sealing surfaces eliminate hard transitions to avoid cycle damage and improve performance. Upper & lower stems seals are designed for the most critical services. Independent, triple sealing is dynamically loaded for added assurance. Unique convex body channel optimizes sealing and reduces adverse elastomer loading on liner. EBRO liners are isostatically molded to reduce porosity and laminations found in compression molding. All operational areas are machined, and have a minimum thickness of 3mm. Liner extends into the stem hubs for added protection. Stem hub areas are isostatically molded solid and then machined, resulting in high quality, stressed-free sealing surfaces. Rating: 800 – 3000 P.s.i. For a quotation on any of the Diflon product range please contact us.